View from the living room into the dining room. Open floor plan. View from the kitchen into the dining room. Chef's kitchen with all new stainless appliances. Bedroom1 - Queen sized bed sleeps 2. Bedroom 2 - Queen sized bed sleeps 2. Bedroom 3 - Bottom bunk sleeps 2 and the top sleeps 1. 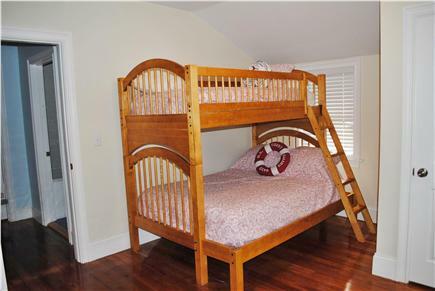 Bedroom 4- Bunk beds - sleeps 2. Front porch has a cozy swing and a bistro table that seats four. Parking for two cars in the front driveway...or even your boat! Walk everywhere from this wonderful location. You can walk into Falmouth Village and enjoy the beautiful shops and delicious array of restaurants. At the end our road is Falmouth Harbor where you can launch your boat, hop on the ferry to Martha's Vineyard, watch the Falmouth Road Race and eat at the Clam Shack. You can also walk or ride your bike to the popular Surf Drive Beach. 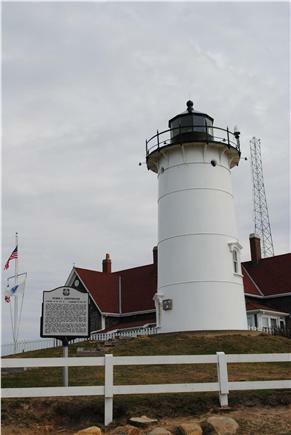 Or, you can ride or walk on the Shining Sea Bike Path and cruise along beautiful beaches, pass Nobska Lighthouse, and enter quaint and historic Woods Hole. 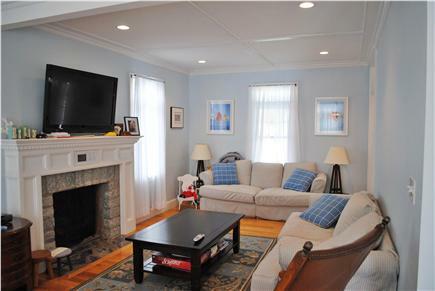 The interior of the house is light and airy complementing the relaxed Cape Cod feel. 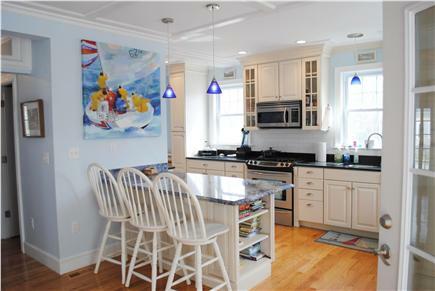 The house has an open floor plan with a beautiful chef's kitchen with all stainless appliances. Bring your K cups for there is a Keurig maker at the house. There are 2 flat screen TV's, a dvd player and wifi. 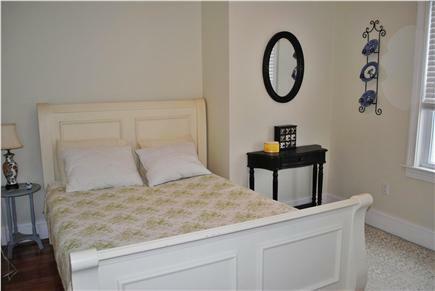 There are four total bedrooms on the second floor that can sleep up to nine people, and three bathrooms, two full baths (one with a jacuzzi tub)and one half bath. 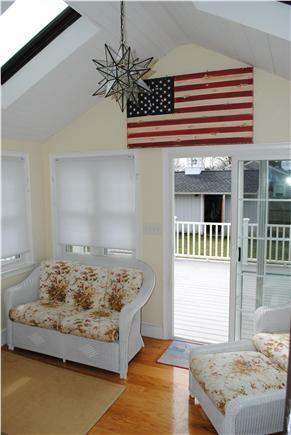 The house has an adorable farmer's porch with a bistro table that seats four and a cozy porch swing. The back porch is huge and flows down to a stamped concrete patio which has an outdoor grill. There is a large yard for games, too! There are two separate driveways, one off the front of the house and then a side driveway. 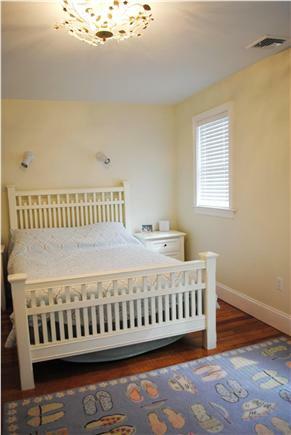 Long-Term Rental (1 month or more): September to June for $2500 per month, depending on party size and length of stay. Utilities not included. Second year at this house. We plan on staying each summer. Home is clean and open. 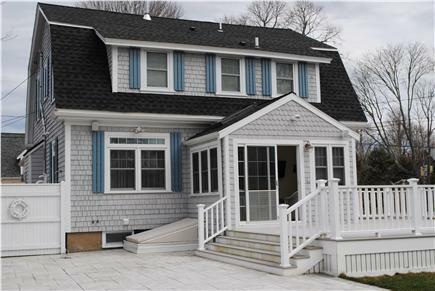 Close to Falmouth Heights and the center of town. Homeowners are very responsive. We highly recommend Falmouth for your stay on the Cape. 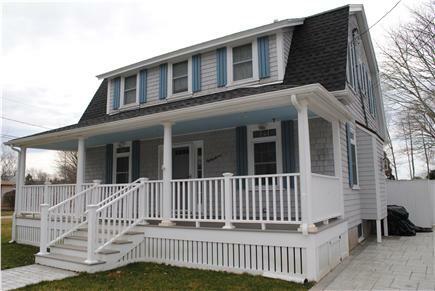 This home couldn't possibly have a better location, and it is a well cared for and comfortable home. The owner is responsive and very easy to deal with. Highly recommend this property! You won't be disappointed. This wonderful home has it all! 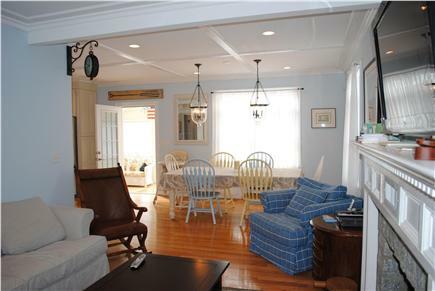 The location is perfect to walk to local restaurants and shops, gives you easy access to Falmouth Harbor and local beaches, and offers comfortable spaces for both quiet time and group activities. This home has a wonderful deck and beautiful outside spaces, which we enjoyed with family and friends. Our favorite spot was the front porch swing! 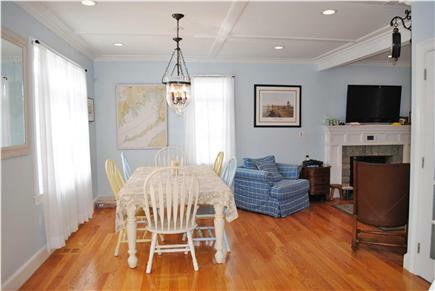 This house was wonderful -- immaculately clean and made to feel like a home away from home. 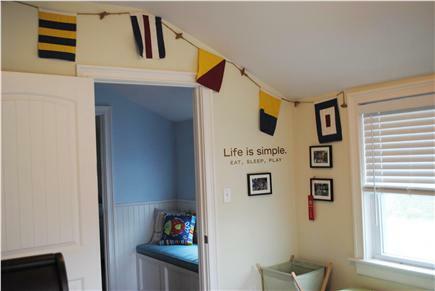 Lots of room for kids to run around and even toys in the basement to keep them busy. Walking distance to some very nice restaurants when you do not feel like cooking. Liz is an amazing host who answered every question we had! My husband and I rented this house with our growing family, all of whom are in their twenties. It was a wonderful vacation. The house comfortably slept 7 adults, as well as provided plenty of space to gather as a group or to have some alone time. The back deck/patio and the large kitchen table were two of our favorite spots! The house has the feeling of a much loved home! The house was lovely and had everything we needed. Very clean and comfortable. Perfect location. 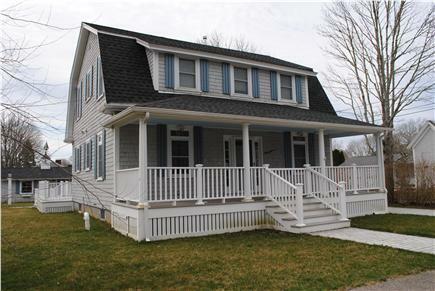 Falmouth is a great town to spend a vacation, and this house was close to everything; downtown, beach, harbor, and bike path. This house was very serene and fully equipped. There was plenty of yard space for the kids to play soccer and whiffle ball. 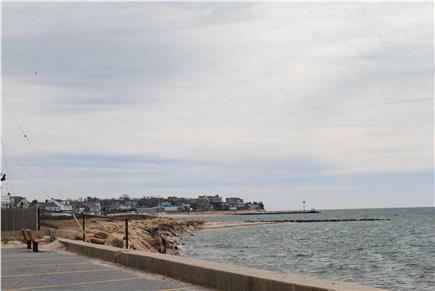 The location was great; a quick walk to downtown, Falmouth Harbor, and Surf Drive Beach. There was plenty of sleeping space and the beds were very comfortable. There was also a lot of "hang-out" space, so everybody could be together or have some quiet time.